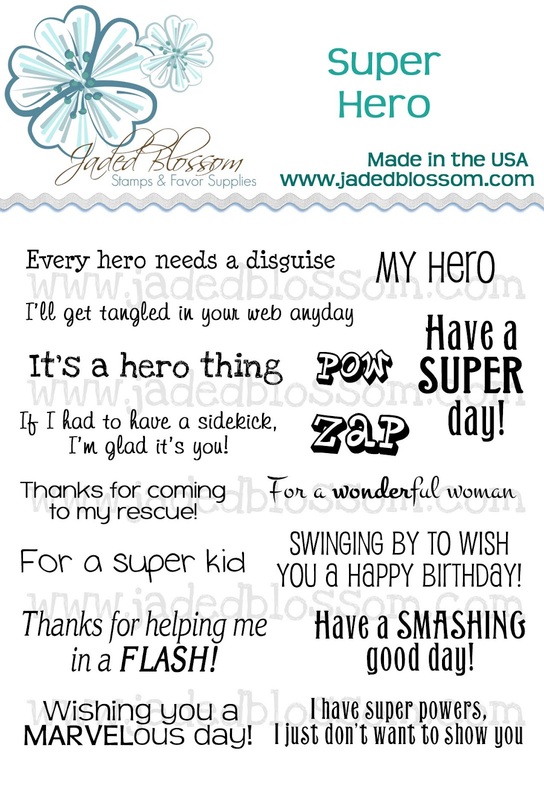 Jaded Blossom: Super Hero Stamp Release Blog Hop! What a GREAT stamp set!! LOVE all the projects everyone did! Thanks for sharing all this creativity!! What a great stamp set. It fits so many kinds of projects. Another great set! Whoo Hooo! This is a great set. Got my fingers and toes crossed. Everyone did a wonderful job all week with the sneak peaks. TFS. Oh wow, these stamps are remarkable!!! love how they can be used for other than superhero!!! I hope I win!!!!! Already a follower and email subscriber! Super cute set, off to hop I go! Have a great day! Just ordered my set...fun hop! What a fun set! Great idea, I've never seen anything like this set.